The Peak Products LED system provides smart lighting for your outdoors. Easily transform your backyard into a vibrant and colorful outdoor space by installing this LED system to your railing, fencing, posts and more. It's perfect for adding light just where you need it, brightening up a living space and celebrating special occasions. 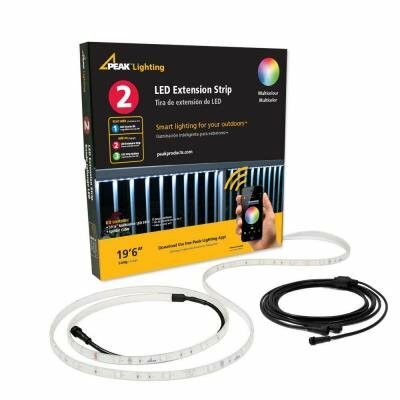 This system is versatile, easy to use and comes in 3 components - the LED starter kit, the LED extension strip and the LED strip holders (Each sold separately). Install this LED system and illuminate your home using the Wi-Fi-enabled peak lighting app on your smart device. Endless color options, music and special effects for this system are available with a few taps on the app to match any mood and style. Get started today and enjoy captivating LED lights in the comfort of your own home within hours. If you have any questions about this product by Peak Products, contact us by completing and submitting the form below. If you are looking for a specif part number, please include it with your message.